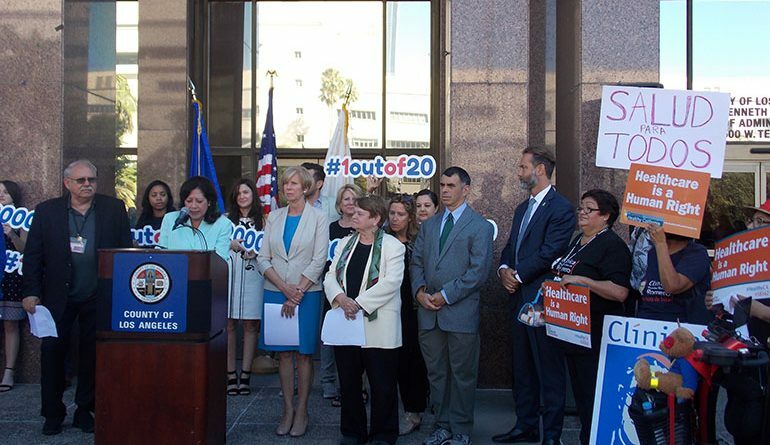 This article, reproduced with permission from Kaiser Health News, looks at how the U.S. Senate’s healthcare reform bill could affect California and Los Angeles County. California risks losing $114.6 billion in federal funds within a decade for its Medicaid program under the Senate health care bill, a decline that would require the state to completely dismantle and rebuild the public insurance program that now serves one-third of the state, health leaders said Wednesday. The reductions in the nation’s largest Medicaid program would start at $3 billion in 2020 and would escalate to $30.3 billion annually by 2027, according to an analysis released by the state departments of finance and health care services. Medicaid covers a staggering 13.5 million low-income Californians — children, people with disabilities, nursing home residents and others. About 3.8 million of them, many of whom are chronically ill, became eligible for coverage under the Affordable Care Act, informally known as Obamacare. California would face the biggest losses of any state, according to a report issued Wednesday by the consulting firm Avalere Health. Federal funding would drop by 26 percent over 10 years, the report said. Many states, including Alabama, Georgia, Texas and Florida, would face a drop of less than 10 percent. The Senate bill to repeal and replace the ACA would be a “massive and significant fiscal shift” of responsibility from the federal government to states, according to the analysis. It would force difficult decisions about who and what to cover and how much to pay doctors, hospitals and clinics, the report said. In addition to expanding its Medicaid population early and vigorously under Obamacare, the state began covering undocumented immigrant children last year. California’s program, known as Medi-Cal, also provides dental care and other services that are optional under federal Medicaid rules. The state’s Medicaid director, Mari Cantwell, said Republican proposals present a fundamental problem that can’t be solved by making cuts around the edges. The losses are more than what was predicted under the House bill. The analysis said that’s because the cost shift increases over time under the Senate proposal. GOP leaders in Congress have been trying to repeal the ACA for seven years, deeming it disastrous public policy that costs too much and leaves consumers with rising premiums and too few choices for care. The Senate bill would overhaul Obamacare in several ways. Besides revamping the Medicaid program, it would dramatically change the system of tax credits used to help low-income Americans get health coverage. The Congressional Budget Office concluded that the bill would cut the federal deficit by $321 billion over the next decade while leaving 22 million more Americans without health insurance. Unable to lock down the support he needs in the Senate, Majority Leader Mitch McConnell on Tuesday postponed a vote on the bill until after the July Fourth holiday. Its fate remains uncertain as senators head back to their districts for a weeklong recess. Under the legislation, the federal government would pay a fixed amount to states for Medicaid expenditures, a per capita rate, instead of paying for a share of all expenses incurred. State health leaders predict that the state’s costs would outpace the federal government’s allocation, meaning California would have to come up with an additional $37.3 billion between 2020 and 2027. The proposed financial caps would have a “devastating and chilling effect” on spending in the Medicaid program and would pinch providers further, the analysis said. California already ranks near the bottom for how much it pays Medicaid providers. The Senate’s overhaul of Obamacare would also force hospitals and clinics serving the poor and uninsured to live within the new financial limits, leading to “uncompensated care in the hundreds of millions, if not billions annually,” according to the analysis. In addition, the Senate bill would phase out funding for the expansion of Medicaid, which enabled 3.8 million single, childless adults and others in the state to qualify. Under the Affordable Care Act, the federal government pledged to pay for 90 percent of their costs. But the Senate bill would reduce that to 50 percent beginning in 2024. Without the promised federal funds, California would have to spend five times more than previously estimated to continue covering those newly eligible. By 2027, the cumulative cost to California would be $74.1 billion, according to the analysis. California leaders vowed Tuesday to fight the bill, known as the Better Care Reconciliation Act. “Simply stated, this is a terrible bill and we must defeat it,” said Democratic Sen. Dianne Feinstein in a call with reporters. Sen. Kamala Harris, also a Democrat, added that the most vulnerable populations are the ones who have most to lose: children, people with disabilities, seniors. “This bill is nothing short of a disaster, and it’s no wonder they did it in secret because they have nothing to be proud of,” said Harris, who aims to kill the bill before it hits the Senate floor. The fallout would be particularly bad in Los Angeles County, home to 1 of every 20 Medicaid recipients in the nation, county officials said Tuesday. Ken Bascom, 62, who lives in Venice, Calif., and attended the gathering, said he lost his job and his employer-based insurance during the recession. Soon after Bascom became eligible for Medi-Cal in 2014, he was diagnosed with kidney cancer. Now cancer-free, Bascom said he often thinks about what would have happened if he hadn’t been able to get health care. Also in attendance was Steven Martin, 27, who said he depends on insurance he got through Obamacare to pay for his leukemia treatment. Martin, who has private insurance through Covered California, the state’s exchange, said his medication costs tens of thousands of dollars each year. “Without insurance, I’m not going to have access to my medication,” he said. Los Angeles County Health Agency Director Mitch Katz said the ACA made a “huge difference” in the county — dramatically cutting the uninsured rate, reducing wait times at emergency rooms and helping connect patients to primary care doctors. Katz said he feared all of that would change if the Republicans succeed in overhauling the health law. Ana Ibarra contributed to this report. KHN’s coverage in California is funded in part by Blue Shield of California Foundation. Kaiser Health News is a national health policy news service. It is an editorially independent program of the Henry J. Kaiser Family Foundation.